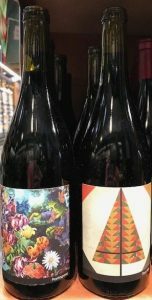 “Since 2008 we have been making mimimalist wines from a variety of Northern California locations.We love the producers and the grapes that surround us: brambly Pinot Noir off of native root stalk from Elk Prairie Vineyards high above the Eel River in Humboldt County, tart strawberry Grenache Noir and Rose from the Tejada family’s beautiful Lake County vineyard, tropical fruit laden Scribner Bend Viognier from Clarksburg’s rich delta soil, lean and mineral Suma Kaw whites from the Sierra Foothills and the white pepper of Albini Carneros Cabernet Franc. All of our wines are produced, aged and bottled from a shared roll up in the light-industrial River East neighborhood of Napa. Each wine is produced in the same manner – native fermentation, minimal so2, neutral oak and ambient temperatures – we do our best to not screw with what comes out of the vineyards, not just rolling with but embracing the differences from one year to the next.” – From their website.